European Scientists Choose Site For Rosetta's Comet Touchdown : The Two-Way After a decade-long journey to reach Comet 67P/Churyumov-Gerasimenko, the ESA says it has found the best spot for a planned November landing. Closeup of Philae's primary landing Site J, which is located on the "head" of Comet 67P/Churyumov–Gerasimenko. 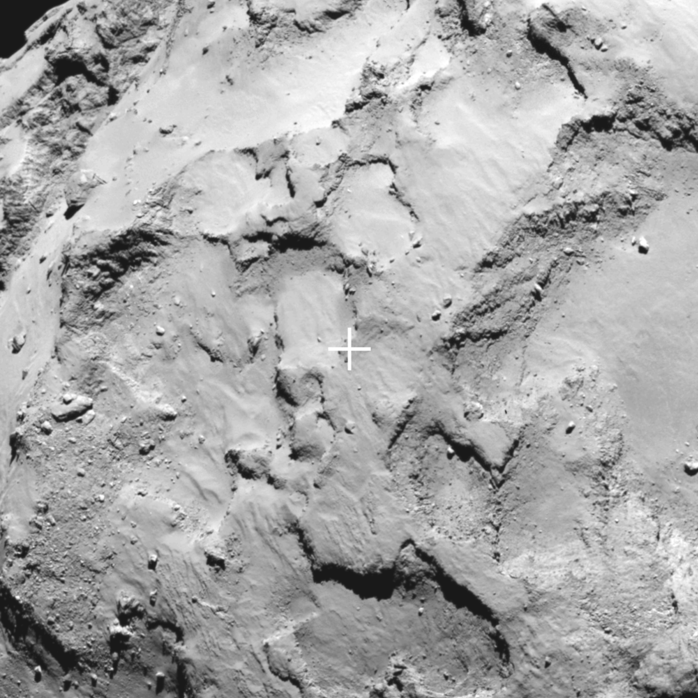 The image was taken by Rosetta's OSIRIS narrow-angle camera on Aug. 20. After the European Space Agency's Rosetta spacecraft spent a decade just catching up with Comet 67P/Churyumov-Gerasimenko, mission controllers have announced the spot where the probe's Philae lander will touch down. 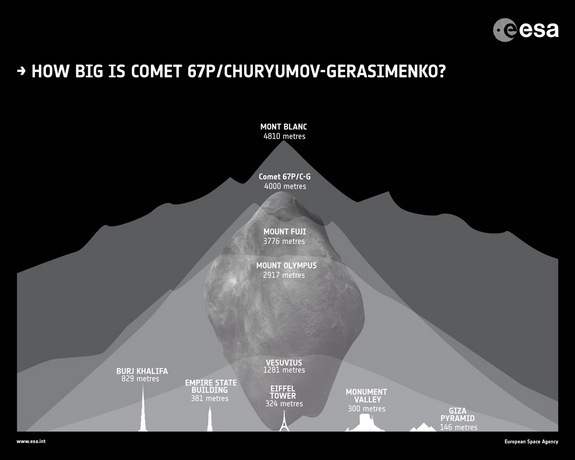 It turns out that there are no really good spots to land on a comet. "This is not an easy task," Stephan Ulamec, the manager for the Philae Lander at the DLR German Aerospace Center, said at a news conference today. "There are flat areas, but there is also rough terrain." The spot chosen, known as "Site J," was selected from a short list of five potential sites that were compiled a few weeks after Rosetta's early August arrival at the comet. At Site J, "there are some cliffs, there are some boulders. ... It's not a perfectly flat area as we probably would have hoped for a safe landing site," Ulamec said. ESA diagram showing scale of 67P/Churyumov–Gerasimenko. Scientists hope that landing will reveal the basic chemistry of comets, believed to be "dirty snowballs" left over from the formation of the solar system some 4.5 billion years ago. A big part of the challenge of finding a good spot to land was that 67P/Churyumov-Gerasimenko turned out to be a bit different than the mission's managers expected. "Engineers, expecting the comet would be a potato-shaped, ice-covered body, put the odds of success at 70 percent. "But after a decade of travel, the Rosetta spacecraft in August reached the twin-lobed Comet 67P/Churyumov-Gerasimenko, which turned out to be part icy, part dusty, part dry and topographically diverse, complicating landing." "The primary landing zone is a sunny region located on the comet's 'head' — the smaller of the two lobes of the 2.5-mile-long (4 kilometer) comet. The region is in close proximity to an area that could become active as the comet starts flying closer to the sun, which could give scientists an unprecedented look at the way a comet works.
" 'We will make the first ever in situ analysis of a comet at this site, giving us an unparalleled insight into the composition, structure and evolution of a comet,' Jean-Pierre Bibring, a lead lander scientist for the mission, said in a statement. 'Site J in particular offers us the chance to analyse pristine material, characterise the properties of the nucleus, and study the processes that drive its activity.' "